Are you a therapist or counsellor looking for a centre for your private practice? The Affinity Centre offers a great package and aims to be so much more than just a room that you work from. Being a counsellor or therapist can be a lonely occupation. At the Affinity Centre we think a community where therapists can give each other support and friendship is important. The centre is very well positioned in the centre of Wilmslow, Cheshire and attracts clients from Macclesfield, Styal, Handforth, Hale, Hazel Grove and South Manchester. All of the rooms at the Affinity Centre are clean, warm, well decorated and relaxing. They are positioned in such a way that conversations in other rooms cannot be overheard, giving privacy and peace to your therapy sessions. There is a kitchen at the centre with a range of teas and coffee available free of charge. Parking is easy for you and for your clients, with an NCP car park opposite the centre and on street parking available directly outside. 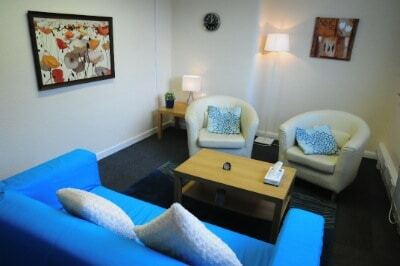 The Centre has free wifi for all therapists and counsellors working there. This can be used either for surfing the internet when you are waiting for a client or for delivering online therapy sessions via Skype. This gives you another potential income stream and increases your range of clients world wide. All therapists and counsellors working at the centre are entitiled to a page promoting themselves on this website*. You can write a profile and appear on the Team page free of charge. This raises your profile and attracts potential clients. There is a referral system that places clients contacting the Affinity Centre with a therapist that will fit them well. This can help you build your practice if you are in need of more clients. There is a small one off charge for each referral which is more than offset by the fees the client will pay you. The cost of renting a room at The Affinity Centre is £100 per block during the daytime and £120 for an evening block. Once you have booked at least one block you can then book adhoc one hour bookings. The charge for this is £12.50 an hour. The block times are as follows. Ian, the director of the Affinity Centre, also runs Soul Healer Websites, a website business aimed specifically at counsellors and therapists. If you are working at the Affinity Centre you will be entitled to a discount on your website build fee. Why not come and have a look around? You can book an appointment by phoning Ian on 01625 529099. You are under no obligation and we have no doubt that you will be impressed with what you see. Alternatively, use the contact form to get in touch.